Corona del Mar or CdM (Spanish for “Crown of the Sea”) is a neighborhood in the affluent city of Newport Beach, California. It generally consists of all land on the seaward face of the San Joaquin Hills south of Avocado Avenue to the city limits, as well as the development of Irvine Terrace, just north of Avocado. 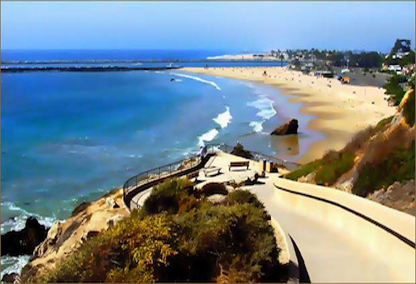 Corona del Mar is known for its fine beaches, tidepools, cliffside views and quaint village shops. Beaches in the area include Corona del Mar State Beach as well as Crystal Cove State Park south of Corona del Mar, accessible by paths winding down a steep hillside. Settled early in the 20th century, the older area of Corona del Mar consists mostly of closely spaced, free-standing, detached single-family houses of varying architecture, concentrated along Pacific Coast Highway (also known as “PCH” or State Route 1). Newer developments in Harbor View Hills consist of California ranch style houses, many with expansive ocean views.